It seems to me that no one can pinpoint when exactly it was that we Belizeans (then British Hondurans) decided that we were worthy of being a nation and that that’s what we wanted to be. Personally, I think that Belizeans were doing an amount of travelling in the first half of the twentieth century apart from the World War I and World War II experiences. Individual Belizeans were coming home and telling our people what they had seen and heard in foreign lands. Our people got to thinking we could have a better life if we did some agitating. Amongst my relatives back then, I had a maternal uncle, Buck Belisle, who worked in Panama from 1941 to 1946. A second cousin, Jerry Belisle (Buck’s first cousin), joined the United States Merchant Marine before I even knew myself. My paternal grandfather’s nephew, Wallace Hyde, travelled all over the world working in the Merchant Marine. So did one of my maternal granduncles, Gilbert Belisle. My paternal grandfather, James Bartlett Hyde, did a lot of travelling along the Gulf Coast of the United States – Corpus Christi and Galveston, Texas; New Orleans and Westwego, Louisiana; Biloxi, Mississippi; Tampa, Florida; Mobile, Alabama; Savannah, Georgia, and up the Carolina coast. To reach these ports, he had to travel along Mexico’s Gulf of Mexico coast – Isla Mujeres, Cozumel, Vera Cruz, Tampico, etc. When did our people first start thinking about becoming independent and sovereign Belize? I guess the most important thing we know is that the millionaire Robert Sydney Turton got tired of being victimized by British colonial tariff laws which were crippling his business dealings with companies in the United States. The fact that Turton began thinking about Belizean self-rule had major implications, not only because he was British Honduras’ wealthiest native, but also because (Right Honorable) George Cadle Price, who would become Belize’s first Prime Minister and be considered “the father of the nation,” was Mr. Turton’s personal secretary and spent a lot of time travelling with him through the United States. These thoughts run through my mind as I sit here late Saturday afternoon writing this column. I know that all over Belize, behind closed doors, we Belizeans are worrying about tomorrow morning at Sarstoon Island. It is quiet in Belize this afternoon going into evening, especially for us older folk. I’m sure younger Belizeans are finding something exciting, and probably noisy, to do with their energy, but we older folk are sitting and thinking and worrying. We are worrying about our beloved Belize. We can say for sure that by September of 1950 when the PUP was formed, we Belizeans felt that we had a separate identity, one which we wanted to build into nationhood. There were Belizeans who were afraid of self-rule for various reasons and they were hostile to the PUP, we know that, but the majority of the people voted for the PUP in free and fair elections, and eventually Belize, under Mr. Price’s leadership, attained political independence, with all its territory intact, and was admitted into the United Nations. Even though the origins of the United Democratic Party (UDP) lay in the same groups who had been afraid of self-rule and were hostile to the PUP in the 1950s, when the UDP finally came to national power in 1984 they essentially embraced the constitutional advances which Belize had achieved under the PUP, and the UDP, by and large, continued Belize’s stride forward to proud nationhood. So then, we are all agreed, Belizeans: we are a separate, distinct, and unique people, and we are who we are – The Jewel. This afternoon, the issue is this: will the journey of the Belize Territorial Volunteers (BTV) to Sarstoon Island tomorrow morning enhance our nationhood or will this trip damage that nationhood? The Territorial Volunteers are a bunch of Belizeans who consider the Sarstoon Island so important that they are willing to risk their freedom, perhaps even their lives, to make a patriotic statement. 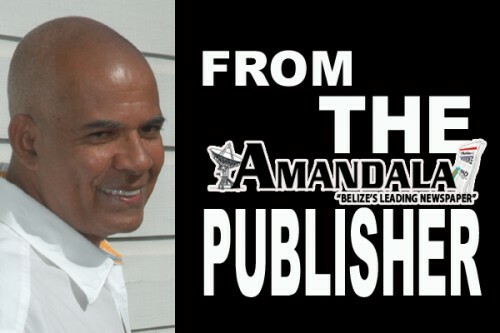 But, spokesmen for the Government of Belize have been saying that the Belize Territorial Volunteers will be endangering the nation and people of Belize when they take the Sarstoon Island bull by the horns tomorrow morning. On Thursday and Friday, in separate sessions with the press, two Belizeans of high standing lent the prestige of their offices to the cause of the BTV. Lisa Shoman is not only a Senator in Belize’s National Assembly, she is a former Foreign Minister of Belize, a former Belize Ambassador to the United States, and she has served as an official observer in general elections in neighboring countries. In addition to all that, she is the representative of the Opposition PUP on the Negotiating Team of the Bipartisan Committee on the Guatemalan claim. When Ms. Shoman announced on Thursday that she would join the Territorial Volunteers on their trip to Sarstoon Island Sunday morning, the UDP Government of Belize screamed “political ploy,” but this was a big time decision by Senator Shoman, and a courageous act of nationalism. On Friday, Roman Catholic Bishop Dorick Wright blessed some of those taking the Sarstoon Island trip, and he expressed support for their initiative. This comes from a prelate who is visibly ailing and unable to make the trip himself. This was another big time move, and I am sure the Territorial Volunteers have been comforted by Senator Shoman’s and Bishop Wright’s decisions. The Territorial Volunteers are under much stress as I write, and at times like these, trust me, you welcome any act or statement of solidarity, no matter how small. It so happens that the Senator and the Bishop are big people: their acts and statements of solidarity are huge. The Territorial Volunteers have no idea how the rest of us Belizeans are praying for them. The party politics of the matter is something we older ones understand after all these years. If the PUP were elected to office tomorrow, their leaders would immediately begin to behave the same unacceptable way the leaders of the ruling UDP are now behaving. The reason for this is that the mighty United States of America leans on any government which is in place in Belize. 65 years ago, in a formal and organized way, Belizeans announced to the world our intention to become a nation. Washington is so powerful that American policy makers have not felt it necessary for them to give Belizeans the respect we Belizeans think we deserve. Tomorrow morning will be a defining moment in Belizean history.